No matter if you want to lighten up the square cutting surface of your kitchen or you want to make your foyer looks beautiful, pendant lights looks beautiful and works beautiful too. What if the case is that you have got a recessed can in your house ceiling and you prefer pendant lights over recessed? Pendant lighting is often used in those areas of your home where direct purpose lighting is needed, or you can also drop them down from a ceiling giving it a beautiful and ambient look. 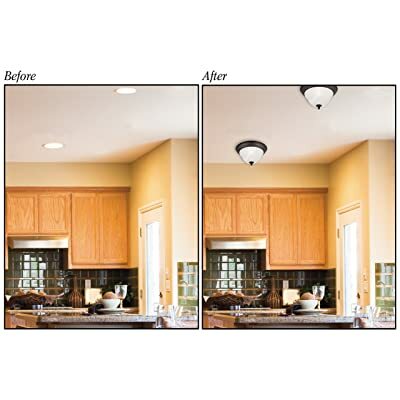 There is a lot of headache if you need to remould a light from recessed into pendant. Remodelling charges, unnecessary hard work and what not? This Westinghouse product this problem very easily also providing beauty due to its look, and proper fitting due to its fine structure. When the functioning of your home is considered along with enjoyment, one of the most important factors is lighting. When you don’t want to rip your wall of this product is surely going to help you to convert recessed light into pendant. Not weighing more than 14.4 ounces it has got dimensions of 8.1 x 1.6 x 8.1 inches. You can hang any light fixture of weight equal to or less than 50 pounds and create a beautiful ambience all around. It can easily fit any recessed housing can with size between 4-6 inch. It’s perfectly designed medallion can easily be painted t maintain and uplift the décor of your room. That means you don’t need to worry if the ceiling colour is blue or white or any other. 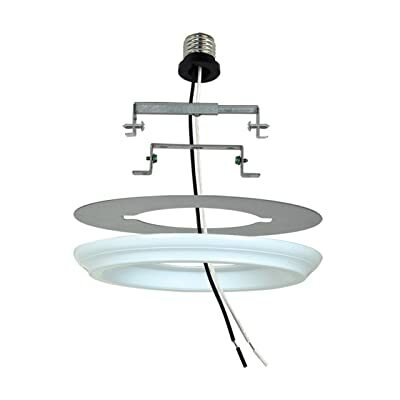 Its base receptor is of medium size and can fit almost all recessed lighting cans. It also includes hardware specially organised or mounting purpose. That means you don’t need to buy to the shop for any other extra thig after this product has been shipped to your home. Its design is very unique of patent-pending type. Want to make your home beautiful and neat with lighting, no? Nothing can be more pleasurable if even the lighting gadget is also beautiful. This white coloured Light convertor has got white finish and is strong enough to hold light fixtures weighting equal to or less than 50 pounds. It is much suited for locations that are damp. It works efficiently with recessed cans that were previously used for light bulbs of medium base R16, R20, BR25, R30, BR38, BR4, PAR16, A19, PAR20, BR30 or PR30 light bulbs. It can be installed very easily and conveniently with the help of socket adapter, adjustable bar with mounting hardware too. One of the points not to be missed is that this product is CETL listed for the safety it provides. It can be installed on your ceiling very easily with the mounting hardware along with the adjustable bar and socket adaptor. It saves your wall from ripping off and also save remodelling charges as well as your energy, no? It has got a beautiful texture and design that won’t ever fail to be an apple of the buyer’s eye. It is a beautiful upgrade that you need to include in your home by step-by-step guidelines. It works with almost all recessed light cans. Works like none less than a charm. The angle is very steep due to which the drill moves arounds. Sometimes you may need to buy an adaptor as the mounting bracket may not remain centred once attached to the housing can. Westinghouse 0101100 Recessed Light Converter has been rated 4.5 stars out of 5 by its satisfied and verified customers. With 65% of customers rating this product 5 star, there is nothing to doubt on its quality and working. It comes in a beautiful white colour that can be repainted, works with almost every recessed can and cuts down the remodelling part too. What else do you need? Click here to redirect yourself to the product.